There are many different types of sorrel. If you are trying to include sorrel in your diet to boost health and nutrition, it's important to understand the difference between two of the more popular varieties. Sorrel (Rumex acetosa) is a perennial herb that is part of the Polygonaceae or Buckwheat family and grows all over the world, including in North America. 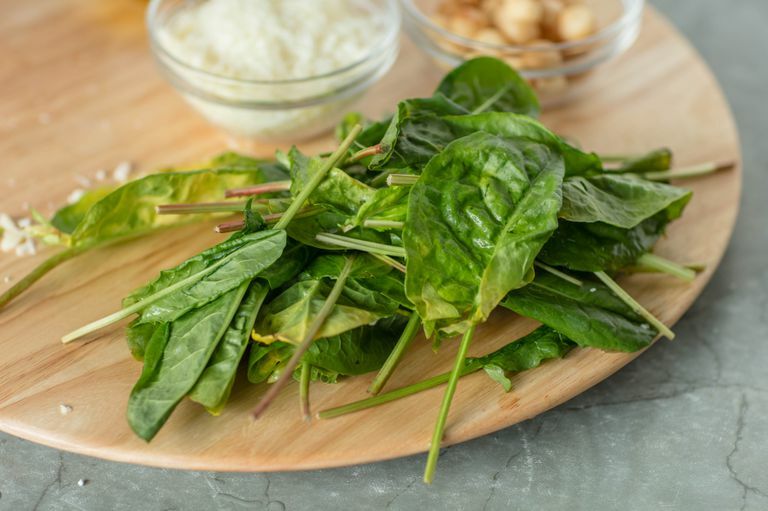 The leafy green commonly is added to salads and is sometimes also called "spinach dock," "garden sorrel," or "common sorrel." Sheep's sorrel (Rumex acetosella) is also a perennial herb that is part of the Polygonaceae family. Also called "red sorrel," "sour weed," or "field sorrel," this herb can be used in foods including soup, but it is commonly used for medicinal purposes. Sorrel is a nutritional powerhouse, providing significant amounts of important micronutrients, including vitamin A, a fat-soluble vitamin that helps you to maintain healthy vision, skin, immune function, growth, and reproductive health. You'll also get a significant boost of vitamin C, an important antioxidant that helps your body to resist infection. A 1-cup serving of fiber also provides about 4 grams of fiber to help you maintain regular bowel movements, cholesterol levels, and blood sugar. Fiber may also help ward against certain health conditions including cancer, obesity, and type 2 diabetes. Sorrel is also sometimes used for medicinal purposes. Sheep's sorrel is a primary ingredient in Essiac tea, a propriety blend of herbal tea that was rumored to cure breast cancer and prevent other diseases including HIV/AIDS and diabetes. However, there is no strong evidence to support any claims about sorrel's medicinal benefits and some health agencies, including the National Cancer Institute and have even raised concerns about its potential to promote tumor growth. Some people also use sheep's sorrel in combination with other ingredients for sinusitis and bronchitis. Several studies have found that the combination may help to relieve certain symptoms such as congestion and headache. Sorrel may also be used for fluid retention, infections, and other conditions but there is insufficient evidence to support any of these benefits. One cup (133 grams) of fresh, raw garden sorrel (spinach dock) provides only about 29 calories. A serving of the herb also provides 2.6 grams of protein and just under 1 gram of fat. A cup of sorrel also provides 4.26 grams of carbohydrate, almost all of which is fiber, according to USDA data. Vitamins in sorrel include vitamin A (5320 IU or 106 percent of your daily recommended intake), vitamin C (64 mg or 106 percent of your daily recommended intake), and folate (about 4 percent of your recommended daily intake). You'll also get small amounts of thiamin, riboflavin, niacin, vitamin B6, and pantothenic acid. Minerals in sorrel include calcium (56 mg), iron (3.2mg), magnesium (137 mg) phosphorus (84mg), potassium (519 mg), manganese (0.5 mg), and small amounts of sodium, zinc, and copper. You'll find garden sorrel (and many other sorrel varieties) in the produce section of most grocery stores. Look for bright green leaves with few or no brown spots. When you get it home, wrap it loosely in a paper towel, place it in a plastic bag and store in the refrigerator until you are ready to use it. Sorrel usually stays fresh for one to two weeks. Sorrel is in season in late spring until mid-summer, usually May to June. Many cooks say that the best sorrel arrives in early spring when the herb is less bitter. Sorrel has a tangy, acidic taste that some compare to lemon zest. The arrow-shaped vegetable adds a complex layer of flavor to green salads, but it can also be used in soups, sauces, and stews. The tangy acidity of sorrel is often used with fatty dishes such as cheese or egg dishes. You can top fatty fishes (like salmon, for example) with butter and chopped sorrel. You might also add the herb to a cheese tray with Marcona almonds. Sorrel tea is also a popular use of the herb. However, most sorrel tea recipes call for dried Jamaican sorrel, also known as roselle (Hibiscus sabdariffa). Sorrel contains a high amount of oxalic acid, so it may be harmful to consume in large amounts due to the possibility of oxalate poisoning. Adverse effects may include damage to the kidneys, liver, and the gastrointestinal tract. When consumed in moderation (in amounts typically found in food) it is considered to be possibly safe. Because of concerns about safety and the lack of safety information available, health experts state that sorrel may be unsafe for children and pregnant women. Like most herbs, sorrel can be frozen, although the texture may change when you freeze it. There are different methods that cooks use. You can chop the herb and place it into the sections of an ice cube tray, then fill with water to freeze. Or you can place it in a baggie and remove extra air so that it is vacuum sealed before placing it in the freezer. ﻿What is a suitable sorrel substitute in recipes? Because the taste of sorrel is commonly described as tangy and acidic, lemon zest may be a suitable sorrel substitute in some recipes. Sorrel Full Monograph. Natural Medicines Comprehensive Database. 5/31/2018. Sheep Sorrel. Memorial Sloan Kettering Cancer Center. About Herbs, Botanicals & Other Products. February 6, 2014. Essiac. Memorial Sloan Kettering Cancer Center. About Herbs, Botanicals & Other Products. March 30, 2016. Essiac/Flor Essence. National Cancer Institute-Health Professional Version. Melzer, J., Saller, R., Schapowal, A., and Brignoli, R. Systematic review of clinical data with BNO-101 (Sinupret) in the treatment of sinusitis. Forsch Komplement.Med (2006.) 2006;13(2):78-87. DOI: 10.1159/000091969.